Conceding to the harsh reality the propeller needs to be removed to complete the S-1201 spinner instillation, Bernie was asked to lend me a hand removing the propeller blades so the S-1202 spinner plate and S-1203-1 spinner bulkhead could be removed to install nutplates. Once the parts were removed the nutplates were bent to match the curve of the parts and then held in position with a screw so the holes for the nutplates could be drilled. Using a screw to hold the nutplate in position on the S-1202 spinner plate, #40 rivet holes are drilled into the spinner plate. All the rivet holes for the nutplates are drilled to #40 and the nutplates are secured with Clecos. After drilling all the rivet holes for the nutplates , all the rivet holes for the nutplates needed to be machine countersunk for flush rivets. I decided to leave the nutplates Clecoed in position to help keep the countersink bit from elongating the holes … likely unnecessary because the spinner plate and spinner bulkhead are made from fairly thick material. After the machine countersinking was completed, the nutplates were riveted onto the parts. All the nutplate rivet holes in both the S-1202 and S-1203-1 require machine countersinking using the countersink cage outfitted with a #40 100 degree countersinking bit. Using the pneumatic rivet squeezer to rivet the nutplates onto the S-1202 spinner plate using AN426AD3-4 rivets. Next work item was drilling the nutplate rivet holes for the S-1202B back plates. After drilling, the parts were given a couple of coats of primer and then white paint and left to dry overnight. Completed gap filler assembly with nutplates installed riveted onto the S-1202 spinner plate. Installing propeller blades … Act 2 … A Déjà vu moment. Today all the parts that make up the gap fillers were quickly riveted together and then riveted onto the S-1202 spinner plate so it could be installed along with the propeller blades so the oil purge process could be completed while extra help was available. With the aid of Bernie and Mike K. the S-1202 spinner plate,S-1203-1 spinner bulkhead and the propeller hubs and blades were reinstalled. I did not want to hold the guys up so adjusted the propeller pitch later in the evening after the oil purge process was completed ... this will be covered in the next post. While performing the oil purge, the spinner was temporarily held in place with a couple of screws so the pitot tube could be protected from being inadvertently snagged while hand spinning the propeller. Upon completion of the oil purge process the spinner was removed so the propeller pitch could be adjusted and bolts set to final torque. Once again the digital level was used to adjust the pitch of the propeller blades to 71.4 degrees which should be a good starting point for doing engine ground run-ups. The process begins by using a couple of equally thick blocks placed on the prop hub so the propeller blades can be leveled. Because the center of the prop hub is rounded, two blocks of equal thickness are used to elevate the digital level so the roundness of the hub does not affect the level's reading when adjusting the blades to level. Now that the propeller is leveled horizontally, the digital level is moved to the canopy rail and zeroed. Once zeroed on the canopy rail, the digital level is attached to the Van's prop adjusting tool (TOOL-00002) and placed on the propeller blade. (Because my digital level has a threaded mount for tripod use I drilled a hole in the adjustment tool and attached the tool to the level with a screw because I do not trust the magnets on the bottom of the level). The reason for zeroing the digital level on the canopy rail is it makes the canopy rail the reference point for the prop angle adjustment … so no matter what angle the airplane is sitting at, by zeroing out the digital level on the canopy rail it takes uneven ground or hangar floors out of the equation. The digital level is zeroed to the angle of the canopy rail by pressing the bevel button then moved to the propeller blade being adjusted to acquire the 71.4° pitch angle. 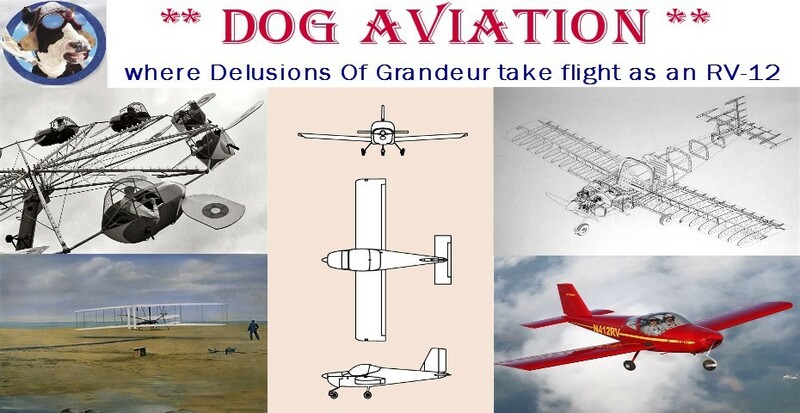 Return from the future: One of the perks of sharing the building process of the Van’s RV-12 via the DOG Aviation Blog is the feedback received from around the world. After posting the photo below covering the process of using a digital level to set the pitch of the propeller, I received an Email from Nick a fellow RV-12 builder in Colorado saying one of us pitched the propeller wrong and would be saying “crap” …. well, that would be me …. Crap! Nick referenced a photo on a page in the latest version of the plans that is not in my plans. I had looked at the new version online and it seemed simple enough, but I managed to mess it up by rotating the prop the wrong way to obtain the required 71.4 degrees. I would have had the first RV-12 in the fleet that could back into a hangar under its own power. Thanks Nick for the sharp eye and taking the time to write and get me pitched in the right direction. Note: The above photo is incorrect ... the level should be leaning to the left and NOT the right. Leaving the photo on the Blog to show readers what NOT TO DO! Using the Van’s TOOL-00002 which was modified so a bolt could be used to attach the tool to the digital level. The propeller pitch is to be adjusted to 71.4 degrees after placing the digital level on the canopy deck and zeroing the level to the canopy deck. This is the correct orientation for the digital level when setting the propeller blade pitch to 71.4 degrees using the Van's provided TOOL-00002 pitch tool. Another perk of having the level orientated correctly is it will stay on the propeller on its own without needing a constant hand on it while obtaining the desired 71.4 degrees..
Once the propeller blade pitch was adjusted to 71.4 degrees, the bolts were snugged up and torqued in three stages of increasing torque to a final torque of 19 foot pounds. After the hardware was torqued, the S-1201 spinner was screwed in place. Torqueing the propeller bolts to a final torque of 19 foot pounds. Tightening one of the 18 Philips head screws that secures the spinner to the Rotax engine. Finally a completed task … the Eagle now has a means of propulsion.